The first SLK was announced in the distant 1996 with the car itself hitting showrooms in 1997. From then to the time of the writing of this article, more than 600,000 SLKs have been sold. Unfortunately, the time has come for the SLK moniker to go. The new car replacing it is dubbed as the SLC, but only the name is different. The car’s proportions, its intended target audience, and platform are the same. The name change comes mostly because of the car the SLK was based upon, the C-Class. Having the K replaced with a C at the end is more indicative of what platform it’s based on. Basically, even Mercedes were caught stating that the SLC is more of a name change rather than an entirely new model. This isn’t a case like the SLS AMG and the AMG GT. Still, there will be a few design characteristics unique to the SLC, but they’re mostly miniature, something they would have done with an SLK update anyway. The first models to launch are the SLC300 and the SLC43, with more to follow. Keep on reading to find out the exact details and specifics. First up there’s the exterior styling. The SLC has a new and redesigned front end with some noticeable differences compared to the last SLK. The front splitter, headlights, air vents and grille are all different. The daytime running lights use LED technology and are now incorporated into the headlights assembly. It’s a much more aggressive front fascia, something the old SLK was sometimes criticized for not having. We would say that new model takes care of that issue right away offering more in this department. The base model has a front grille with a black and chrome finish, with touches of iridium silver louver. The Sport, on the other hand, has the same diamond grille but finished almost entirely in chrome. The special Night package gives you center louvers finished in glossy black (how appropriate to the name). The only thing remaining from the SLK is the front hood, but the design of the headlights makes it seem like the hood, and the grille is one piece rather than two separate entities. The side features only small differences from the previous model. The center side louver goes inside the vent rather than ending before reaching it, making the SLC appear more elegant. The body line right above the vents begins at the top of the fender and turns sharply as it reaches the middle point of the door. The SLK differs because it had a line that runs straight through the door, with no sharp turn in the middle. The back sees very few differences too. The bumper is now almost completely smooth. The taillights have kept their original shape but have a different design which keeps the reverse lights at the rear, having only the reflectors and the side markers going around onto side corner panel. The rear deck is the same, with the only difference being a slight arch which incorporates a high-mounted LED brake light that is now less pronounced than it previously was. The air vents sink further into the bumper at each corner and reflectors has been incorporated into the entire design, sitting right above the exhaust pipes. Speaking of exhaust, the exiting tips are now slanted and wider, but also shorter and pushed more inwards. The simple concept continues with the rear diffuser which decorates the lower part of the fascia. It too is finished in chrome. It may still look like an SLK, but the amount of work that’s gone into the smaller details makes it unique vehicle in every way. Think of it as a middle point between a simply rebadged job and an entirely new version (or generation). The interior of 2017 Mercedes-Benz SLC has been refreshed too, but it’s less obvious than the exterior. At first glance, everything is a carryover, but we had a side by side comparison and the differences are quite obvious. Nearly everything is changed but in such a subtle way that you need to have them together just to be able to tell what’s different. The door panels, seats and center console for instance are all very similar in appearance but have a new design that represents an evolution from the old one. The materials are of high quality, and the fit and finish is superb, something we’ve come to expect from Mercedes, especially in this class. The seats themselves are comfortable and supportive overall, but we could do with a bit more side bolstering, something that you certainly feel in sharper corners and if you decide to attack it at higher speeds. One thing we fell in love with almost instantly was the lighting package. It adds a variety of lights throughout the cabin in places like the foot wells, side panels, and center console. There are three colors available: solar red, polar white or polar blue. The SLK had a great cabin, but the SLC manages to outshine it in every measurable way which is no easy task to achieve. 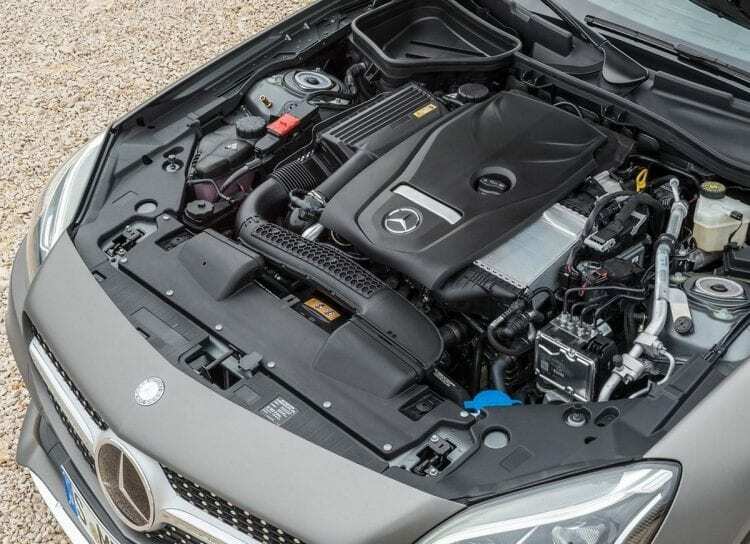 The SLC300 has a 2.0-liter turbocharged four-cylinder developing 241 hp and 273 lb-ft of torque as a base unit. It’s mated to a nine-speed 9G-Tronic automatic gearbox that also has manual control mode. It manages to reach 60 miles per hour in 5.7 seconds and will go all the way up to limited speed limit of 155 mph. Quarter mile run is done in decent 14.7 seconds while the acceleration from 0 to 100 mph is rated at 14.0 seconds. Should you want more power, you’ll probably have to spend more money on the SLC43. It’s got a 3.0-liter twin-turbo V6 with 362 hp and 384 lb-ft of torque. With so much grunt it has no issues completing the 0 to 60 mph sprint in just 4.6 seconds. The 100 mph mark is reached in 10.2 seconds and the same amount of time is needed for quarter mile run which is more than incredible. Expect lots more engine choices including the crazy hot bi-turbo V8 from the C-Class soon. It’s crazy how good the new CLS corners. For a convertible, it’s remarkable how rigid it feels. It loses almost nothing in comparison to a hard-top but gains the thrills of open-top motoring. It’s agile and nimble on its feet. It certainly isn’t a driver’s car, but you can take it down or up some twisties and have great fun doing it. Latest what we could hear about prices is that it will start at around $48,000 for the base model. Higher trim models figures are still unknown, but it is highly possible to see significantly higher numbers. If you want SLC43 than don’t be scared if you see figures of $60,000 and similar.